You’d be hard-pressed to find more ardent supporters of 3D printing then we here at Hackaday; the sound of NEMA 17 steppers pushing an i3 through its motions sounds like a choir of angels to our ears. But we have to admit that the hard plastic components produced by desktop 3D printers aren’t ideal for a number of applications. For example, the slick plastic is useless for all but the most rudimentary of wheels. Sure there are flexible filaments that can give a printed wheel a bit of grip, but they came with their own set of problems (not to mention, cost). 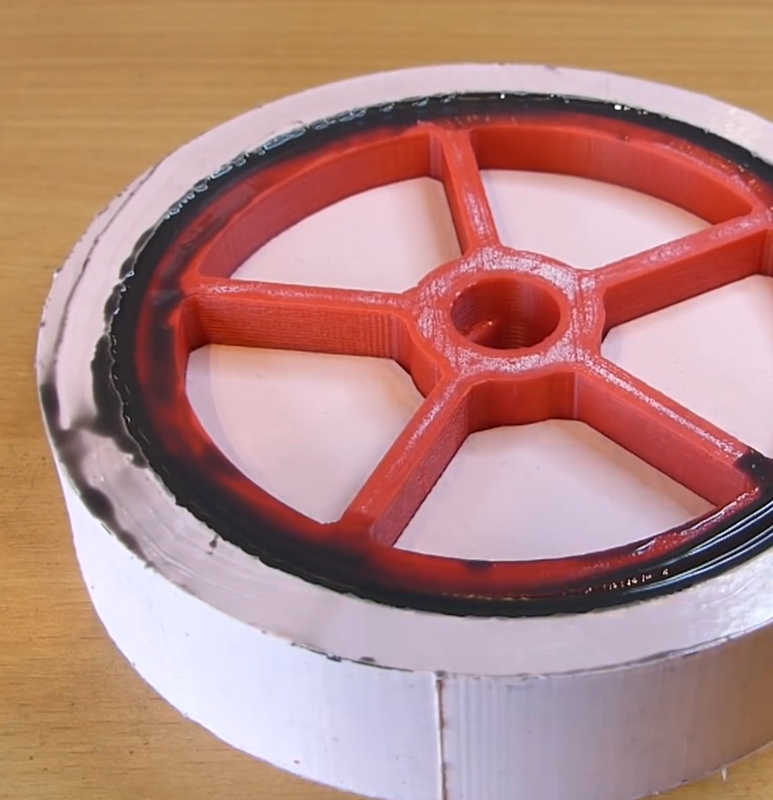 In the video after the break, [Design/Forge] demonstrates a clever method for fitting polyurethane rubber “tires” onto 3D printed hubs which is sure to be of interest to anyone who’s in the market for high quality bespoke wheels for their project. The final result looks extremely professional, and while there’s a considerable amount of preparation that goes into it, once you’re set up you should be able to pump these out quickly and cheaply. The process begins with a 3D printed mold pattern, which includes the final tire tread texture. This means you can create tire treads of any design you wish, which should have some creative as well as practical applications. The printed part is then submerged in silicone rubber and allowed to cure for 8 hours. Once solidified, the silicone rubber becomes the mold used for the next steps, and the original printed part is no longer needed. The second half of the process is 3D printing the wheels to which the tires will be attached. These will be much smaller than the original 3D printed component, and fit inside of the silicone mold. The outside diameter of the printed wheel is slightly smaller than the inside diameter of the mold, which gives [Design/Forge] the space to pour in the pigmented polyurethane rubber. The attentive viewer will note that the 3D printed wheel has a slight ribbed texture designed into it, so that there will be more surface area for the polyurethane to adhere to. Once removed from the mold and cleaned up a bit, the final product really does look fantastic; and reminds us of a giant scale LEGO wheel. Whether you’re casting metal parts or just want a pair of truly custom earbuds, creating silicone molds from 3D printed parts is an extremely useful skill to familiarize yourself with. Though even if you don’t have a 3D printer, there’s something to be said for knowing how to mold and cast real-world objects as well. How could you build an artificial tadpole? Or simulate the motion of a cilium? Those would be hard to do with mechanical means — even micromechanical because of their fluid motion. Researchers have been studying shape-programmable matter: materials that can change shape based on something like heat or magnetic field. However, most research in this area has relied on human intuition and trial and error to get the programmed shape correct. They also are frequently not very fast to change shape. [Metin Sitti] and researchers at several institutions have found a way to make rapidly changing silicone rubber parts (PDF link) that can change shape due to a magnetic field. The method is reproducible and doesn’t seem out of reach for a hackerspace or well-equipped garage lab. Most of the robotics projects we see around here are heavy, metallic machines that move with exacting precision with steppers, servos, motors, and electronics. [Matthew] is another breed of roboticist, and created a quadruped robot with no hard moving parts. [Matthew] calls his creation the Glaucus, after the blue sea slug Glaucus atlanticus. Inside this silicone rubber blob are a series of voids, allowing compressed air to expand the legs, gently inching Glaucus across a table under manual or automatic control. Even though no one seems to do it, making a few molds for casting on a 3D printer is actually pretty easy. [Matthew] is taking this technique to an extreme, though: First, a mold for the interior pressure bladders are printed, then a positive of this print made in silicone rubber. These silicone molds – four of them, for the left, right, top and bottom – are then filled with wax, and the wax parts reassembled inside the final ‘body’ mold. It’s an amazing amount of work to make just one of these soft robots, but once the molds and masters are made, [Matthew] can pop out a soft robot every few hours or so. There’s a lot more info on Glaucus over on the official site for the build, and a somewhat simpler ‘compressed air and silicone rubber’ tentacle [Matthew] built showing off the mechanics. Video below.